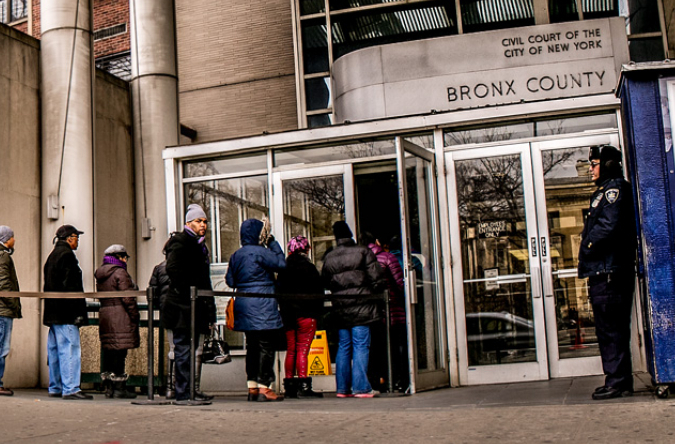 Bronx Housing Court. Though legally available, there are many resources undocumented immigrants are unlikely to use. Earlier this March, Jennifer Gray-Brumskine, a housing organizer for Make the Road in northern Staten Island, went to a building to discuss tenant organizing with the residents. But Gray-Brumskine says the conversation quickly transformed into one about deportations: The women in the room were concerned that under Trump’s January 25 executive order, their kids could soon to be deported for offenses as minor as smoking marijuana. Staten Island’s North Shore was one of several neighborhoods targeted by ICE this February in raids that lead to the arrest of 41 undocumented New Yorkers, but the fear is not just in Staten Island. Housing justice organizers and faith leaders in several neighborhoods told City Limits that since the election, fear of deportation has become one of the largest challenges in their work, with undocumented tenants afraid to stand up to threatening landlords or apply for housing assistance. It’s uncertain how many tenants face a realistic threat of deportation. As City Limits and The Nation reported earlier this week, despite Mayor de Blasio’s promises that New York City will remain a “sanctuary city,” the administration has limited powers to prevent ICE from making arrests. Yet organizers say there are still ways for undocumented families to resist illegal harassment and to obtain housing assistance without fear it will be used against them. While undocumented residents are facing housing instability in neighborhoods across the city, organizers in neighborhoods designated for a possible rezoning are particularly concerned that accelerating speculation will make the undocumented more vulnerable to housing instability, and note that the undocumented are often not eligible for new affordable housing projects. Housing organizers are trying to make sure undocumented immigrants are aware they do have housing rights. Federal, state and city laws, including the Federal Fair Housing Act, the New York State Human Rights Law, the New York City Human Rights Law, prohibit discrimination on the basis of immigration status. It’s illegal for a landlord to violate a rental contract, harass a tenant, deny services, charge extra rent, or refuse to offer housing simply on the basis of someone’s status. It’s also illegal for the landlord to threaten to report a tenant to ICE in order to prevent them from filing a complaint. Despite these protections, however, some landlords still illegally use the threat of deportation as a way to coerce tenants into staying silent. Three housing organizers told City Limits they believed this trend had gotten worse since the election. Goldiner said she knew of a small, partially vacant building where the landlord had recently threatened to report the remaining tenants to ICE, and three of the four last tenants then left. “We think we could prevail under a discrimination claim, but people are understandably very frightened about what could happen to them and their families, so I think mostly we’re seeing people not wanting to come forward,” Goldiner says. Goldiner is herself unclear about whether a tenant could actually be at risk of deportation if their landlord reported them to ICE. She asked someone in another unit of Legal Aid. “‘Maybe. I can’t say for sure they wouldn’t,’” was the reply. Cathy Dang, executive director of CAAAV Organizing Asian Communities, says that due to the executive order’s emphasis on deporting people who have been charged with crimes, including those accused of misdemeanors and people who were charged with a crime and whose cases have not been resolved, she’s most concerned about landlords reporting undocumented residents who may have minor offenses on their records. The undocumented tenants that CAAAV works with have continued to organize against building harassment, but CAAAV is now being extra careful to ensure undocumented residents are not at risk of being identified. For instance, rather than encouraging tenants to wage a public battle in the media and attend public events, CAAAV might instead pursue legal action against the landlord or get a public official to weigh in. “The landlords tend to escalate on the tenants when the threat is coming from the tenants,” Dang says. Pastor Richard Perez of Christ Crucified Fellowship in Washington Heights is also trying to find a balance between encouraging tenants to stand up for their rights, and protecting those tenants from public exposure. He says that an undocumented resident told the church that their landlord was refusing to make maintenance repairs. Volunteers affiliated with the church helped patch up the person’s apartment so they wouldn’t have to fight with the landlord. “Some cases are meant to be opportunities … to show solidarity to the person,” Perez says, explaining that although it’s important to fight injustice in the public eye, it’s also important to be attentive to the actual vulnerability of the people involved. “While I one thousand percent agree that those of us with more power and more platform should always bring the ‘giant’ to public, we can’t do that at the expense of further ignoring the needs of the little guy,” he says. Advocates say the threat of federal deportation policies has made local support networks—of nonprofit providers, but also of building neighbors and fellow worshipers—among the most vital resources for the undocumented. And it’s also made top-down enforcement efforts like New York State’s Tenant Protection Unit, which investigates and takes legal action against landlord fraud and harassment, even more vital. Dang says she’d like to see more prosecutions of bad landlords by the city’s district attorneys. Federal laws prohibit undocumented residents from receiving many of the housing resources available to citizens and other documented residents. How these two laws are actually applied is a little murky. The federal Department of Housing and Urban Development (HUD) has not made it clear which of its programs constitute a “public benefit.” In addition, the two laws offer a slightly different list of who is considered eligible. For instance, the welfare reform bill makes eligible certain victims of domestic violence without green cards, but Section 214 does not. This makes for some uncertainty in how the two laws interact. In addition, nonprofit providers are not required to ask a person’s immigration status when they’re providing housing assistance other than those prohibited under section 214. In practice, this means that by not asking their participants’ legal statuses, nonprofits can provide a variety of services to undocumented people—including, among others, homeless prevention services, supportive housing and Community Development Block Grants. In addition, undocumented residents can live in public housing or benefit from another program for which they are not eligible if at least one member of the family is documented. The rent subsidy, however, will only take the documented members of the family account, which Goldiner says effectively makes public housing unaffordable to many undocumented families. A family can also receive emergency assistance through the city’s “One Shot” program if at least one person of the family is documented. Some undocumented residents fear that residing in government housing, or getting help from the “One Shot” program could be used against them down the line. In fact, while the government can refuse to grant someone legal status if they are deemed a “public charge” dependent on cash assistance or government institutionalization, the government is not allowed to deny someone status solely because they receive HUD-funded housing assistance. The Public Advocate’s website says that the residency requirements for affordable housing opportunities in private developments will vary case by case depending on the funding source. Goldiner says that undocumented immigrants can rarely partake in the lotteries because their incomes are too low, they have no way to prove their income level, or the project in question uses federal funding for which the person is ineligible. And Perez says that most undocumented families are simply not comfortable with entering the lotteries and having such a level of interface with the city. In areas where rents are increasing, or where landlords are selling their properties to investors with an eye for redevelopment, undocumented immigrants are in somewhat of a double bind, says Reverend Faith Togba of Bethel Worship Center in Staten Island’s North Shore. “This is the irony: the city [sponsored apartments], they can’t [rent] because of lack of legal documents; you have to show to be able to eligibly own or rent. Then, secondly, the private ones that they could rent, prices are going up!” he says. To make things even worse, many such immigrants have become more afraid to go out looking for the kinds of job opportunities, such as cleaning work, by which they have sustained their families and paid their rents in the past, he says. Housing advocates and faith leaders working in the North Shore, East Harlem, and Chinatown expressed concern that city policy decisions—including proposed upzonings, but also the choice not to enact the community-driven rezoning crafted by the Chinatown Working Group for Chinatown and the Lower East Side—is exacerbating the kind of tenant harassment that places undocumented people especially at risk of displacement. If we really want to make New York a true “sanctuary city,” advocates says policymakers need to focus more attention on preserving the housing stock where undocumented residents typically live: rent-stabilized housing. They say Governor Andrew Cuomo should focus on reforming the existing rent regulation system, while Mayor Bill de Blasio should support the passage of the Stand for Tenant Safety bills to prohibit construction-related harassment, and funnel more funds to the preservation of rent-stabilized buildings, the enforcement of rent-regulations, and to tenant organizing groups. Furthermore, advocates say that the city should ensure housing lotteries are accessible for people of all legal statuses. Unfortunately, even though their housing challenges are among the most severe, undocumented residents are not always part of the rezoning conversations. “We talk to [undocumented] people about the issue of rezoning and people are definitely fearing displacement … As rents start to rise, it’s even more difficult for them to find affordable and healthy housing,” says Gonzalez. But in East Harlem, she explains, such residents are “really reluctant to become involved,” in part because of their tenuous legal status. If you entered the USA illegally you are subject to immediate deportation. That is the law. What is it about the word “illegal” that is difficult to understand? A mix of sometimes conflicting concerns were aired as the city heads toward a rezoning of the area.